More and more of us are watching shows on demand. On-demand technology has been with us for a decade, but it’s always been a second choice, compared to using the DVR or watching live. This is especially true for DIRECTV Satellite customers. In the past, On demand shows weren’t really “on demand” — it took 10-15 minutes to buffer enough content to watch an HD program just a few years ago. Despite what the cable company commercials like to say, that isn’t true anymore. Most on-demand programs have a 720p version that starts streaming instantly on all but the slowest internet connections, and most people have fast enough internet to start streaming full HD within 10 seconds. Plus, people are just getting more used to on-demand streaming and it’s just a habit. Netflix, Hulu, Prime, and others are on-demand experiences and it’s just getting to the point where we are used to getting content that way. There are two easy ways to get to the on-demand programming for a specific channel. The first is to go through the guide. If you look carefully, you’ll see that some channels have a little “+” in a triangle next to the channel’s name. With those channels, just arrow all the way to the left and press SELECT. You’ll go straight to the On Demand page. The other option is even easier (in most cases.) 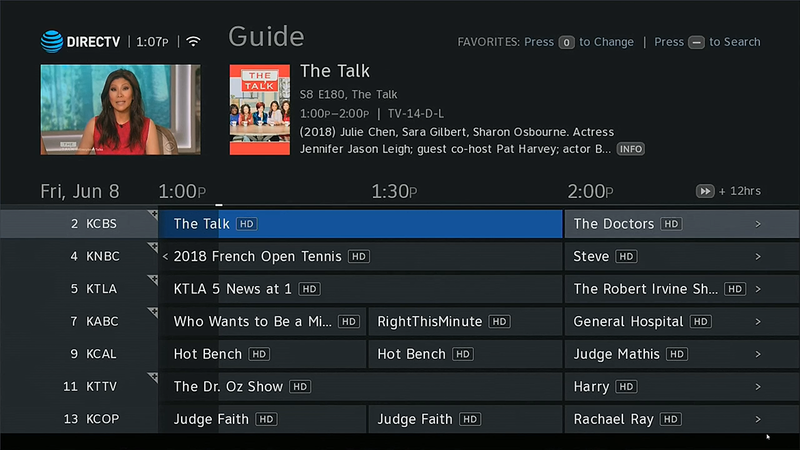 For three-digit channels, you’ll find that you can get to the On Demand page by putting a 1 before the channel number. In other words if you’re looking at HBO (channel 501) then the on demand page can be reached by pressing 1501 on the remote. You’ll find that if you live in the Los Angeles area, it makes sense. In that market, CBS is on 2, NBC on 4, and so on. However in other markets it just doesn’t. You can also simply search for what you’re looking for by pressing the DASH button (to the left of the zero) and entering in a title. If there are on-demand programs available, you’ll see them. Usually there’s a “WATCH NOW” graphic to the right of the episode’s title when you look at it on the list. This works of course but sometimes the episodes have expiration dates. While your playlist will tell you that, it’s usually easier to just choose them on demand when you want them. If you have data caps that you’re trying to get around, or if you know that you usually watch during a time of day when the internet’s congested, recording does make sense. Why can’t you “RF Modulate” an HD signal?